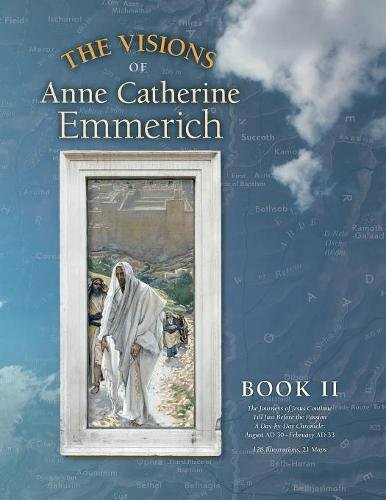 Anne Catherine Emmerich - Anne Catherine Emmerich (Sept. 8, 1774-Feb. 9, 1824) lived from early childhood in almost constant inner vision of scenes of the Old and New Testaments. Her early visions were mostly of pre-Christian events, but by the time she had become (at 29) an Augustinian nun, they were concerned primarily with the life of Jesus. In November, 1812, Anne Catherine was permanently confined to bed, shortly thereafter received the stigmata, and was for the rest of her life sustained almost exclusively by water and the Eucharist. Many came to visit her, among them the poet Clemens Brentano, who was so impressed by her radiance that he moved nearby to record her visions. On July 29, 1820, Anne Catherine began to communicate to Brentano scenes of the day-to-day life of Jesus, which in due course encompassed the better part of his ministry. She was able to describe in extraordinary detail the places Jesus visited, his miracles and healings, his teaching activity in the synagogues and elsewhere, and the people around him. Anne Catherine and Brentano worked together daily until her death on February 9, 1824, except for one period of six months. Various editions of the visions have been assembled over the years, but only recently (2009) have Brentano's complete notebooks (38 volumes) been published, and this new edition benefits greatly from this new resource, particularly in a Dramatis Personae that provides summaries of the primary holy men and women.